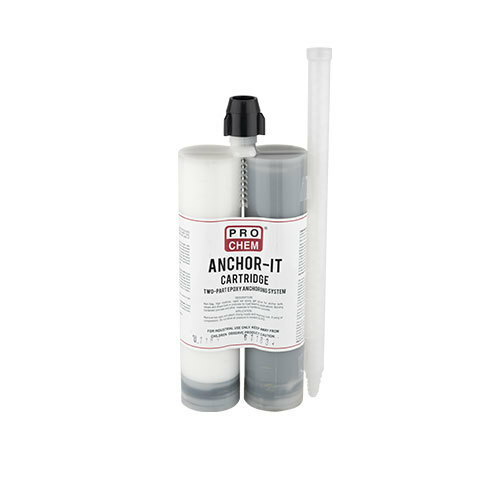 Anchor-It | Pro Chem, Inc.
ANCHOR-IT is a two-component, 100% solids, rapid setting, epoxy anchoring system packaged in easy-to-use 300 mL dual cartridges. This unique cartridge assures the correct portioning and thorough mixing of the epoxy, which is color-coded to assure that mixing is complete. It has a wide variety of uses, including setting of machine anchor bolts for load bearing applications. ANCHOR-IT adhesive and repair cartridge system is dispensed with #4225 cartridge handgun. This handheld, manually operated gun provides a convenient, cost effective method to accurately apply product with minimum waste. Remove top caps and attach mixing nozzle and relating nuts. If using air compression, do not allow air pressure to exceed 65 PSI. Do not apply when temperature is below 33°F, or to latex-modified mortar or latex-modified concrete.